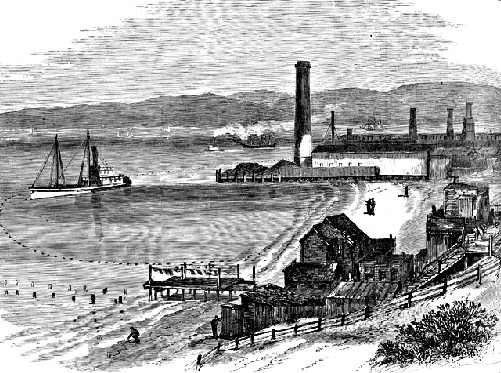 William Ralston, after his Bank of California closed its doors on "Black Friday" in 1875, took his daily swim off the end of Larkin Street in the shadow of the Selby Lead Smelting Works and unexpectedly drowned. Saturday, August 27, 1875, the day after "Black Friday," the fiscal panic that destroyed his Bank of California, William C. Ralston, "the financial autocrat of the Pacific," went for his habitual afternoon swim near Meigg's Wharf -- and never came back. His pale, bloated body was recovered some time later. Ralston's death caused a nationwide sensation. He had been the biggest mover-and-shaker on the West Coast prior to the collapse of his bank. During the Gold Rush, Ralston had skippered a steamship carrying passengers between Panama and San Francisco. By the late 1850's, he had settled down and gone into banking. In 1864, he opened the Bank of California at Battery and Washington Streets. Though an immensely rich and popular figure, he was famous for his modesty: when they tried to name a town after him, he refused, and so they named it for his modesty instead. Hence the Central Valley metropolis of Modesto. Ralston was also legendary for his wildly immodest financial speculation and construction projects. He built an eighty-room mansion in Belmont and staffed it with a whole city of servants; even its stables were built with mahogany and lined with mother-of-pearl. He raised theaters and operas. He built San Francisco's all-time most magnificent architectural landmark, the Palace Hotel. And during the epidemic of speculation that fed off San Francisco's 1865-75 silver boom, Ralston managed to buy up most of the Comstock lode, including its epicenter, Virginia City. His bulimic appetite for Comstock-related investments--lumber stocks, stagecoach companies, mills and mines--proved his downfall. When the transcontinental railroad (completed in 1868) failed to bring the economic boom all had expected, and when competitors threatened his silver interests, Ralston's overextended holdings collapsed. On Black Friday, 1875, depositors lined up outside his bank; soon the whole area around Sansome and California Streets was swarming with customers hoping to close their accounts. Ralston harangued the crowd to no avail, for the bank was forced to close. The next day, Ralston took his fatal swim. 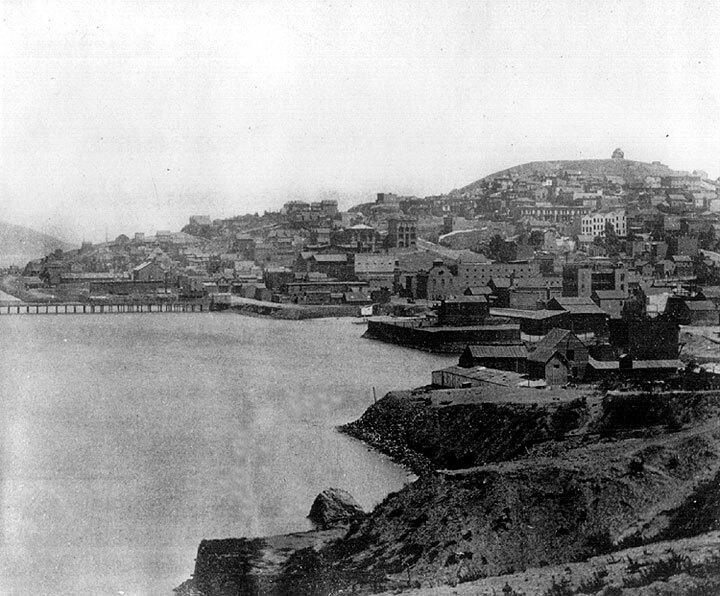 View southeast from Black Point (today's Fort Mason) across North Beach when it was heavily industrialized, and Telegraph Hill was still largely unoccupied, c. 1890s.